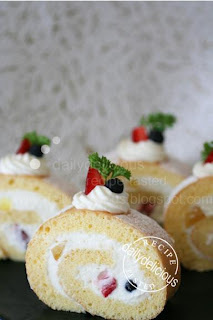 dailydelicious: Simply Fresh Fruit Rolled Cake: Simple cake that looks great! 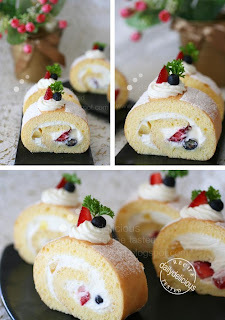 Simply Fresh Fruit Rolled Cake: Simple cake that looks great! I have a lot of work at the end of each month (well, if you work as the accountant you will understand me >*<). So I will have less time for my baking world ^ ^", and I really don't like this situation. But baking is what I live my life for, so I must make something, easy quick and yes, lovely haha. So, to fulfill my need this cake is the answer. Simple but with a little decoration, this cake can be a show stopper for your party. The method for this cake is very easy, and foolproof too. By beating the egg white separately, the precious air pocket that you need for making the sponge cake puff up in the oven ^ ^. I think that if you afraid to make the sponge cake, this is the one that you must try, and you will be happy with the result, I promise. Line the base of 30X30 cm pan with baking paper. Using hand mixer, beat the egg white with sugar (add the sugar gradually) until stiff peaks form. Pour the egg yolks into the egg white, beat with low speed for 1 minutes. Sift the flour into the bowl and fold to combine. Pour the melted butter into the bowl, and fold lightly to combine, then pour the batter into the prepared pan. Bake for 9-10 minutes, or until lightly golden. While baking the cake, spray the clean table clothes with water. 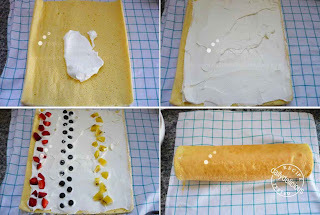 As soon as the cake came out of the oven turn the cake over the clothes, pull the baking paper off. Roll the cake with the clothes, then let the cake cool on the wire rack. Whip the whipping cream with the sugar until soft peaks formed. 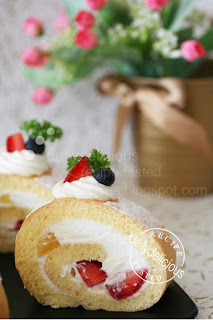 Unfold the cake and spread the whipped cream over the cake, fill with the fruits. Decorated with fruits and whipped cream (as you like ^ ^). Good morning, nice new week with very lovely cake. I love this cake very much. About the illegal copy of Kenh 14, still find your recipe and picture with their logo revised. Seems that, they can not remember from whom they stole. Because too much of time they stole. Anyway they all stay behind because they do not have creative mind and self respect, right? 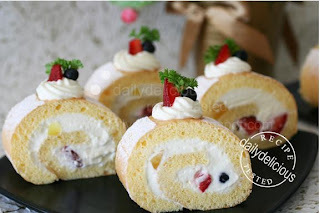 your cake roll look lovely and soft!! thanks for sharing the recipe and steps! I tried this recipe, it is indeed simple and delicious. Thanks so much!! The step by step photos are very helpful! My sponge cake was a little wet, I guessed I wet my towel too much. I know that they won't change, Thank for your concern, ^ ^. I'm glad that you like it, well, the wet towel can be a problem, I have the problem too, but mine is too dry and the cake stick to the towel >*<. You have a wonderful and informative blog. I've tried this recipe and it's too good to be true. Only problem is my cake stick to the towel. I think I spray too much water. I'll try your other recipes soon. Tq. This is a wonderful recipe Pook! May i know what sz of eggs to use? medium or large? I use egg that weight about 50g /egg. I enjoy reading your blog and some of the recipe is easy. (I am just learn to bake). I had tried this recipe a few times and never fail. If I wanted to make chocolate roll can I substitute the flour with some cocoa powder? How many grams do I need to replace the flour? If you want to make a chocolate roll cake, use 10g of cocoa powder and 30g cake flour instead. Hi, may i know what is the height of your baking tin that you used to bake the swiss roll in? Thanks. Mine is about 1 niche hight. Hi,what are the tips that you will give when beating the egg white to stiff peak, as well as whipping the cream to soft peak? Waiting to hear from you asap! Thanks! For whipping the egg white you need a clean bowl (do not use the plastic bowl it's hard for the egg white to attach to it, plus they are greasy if not clean properly ) and whisk, a bit of grease will prevent the egg white to obtain the high volume. If using the hand mixer, medium speed is recommended, it may take longer to whip it but the meringue will be stable. Pour the whipping cream into the bowl, then chill the bowl and whisk for 30-60 minutes. When ready to whip place the bowl over the ice bath, cold whipping cream is easier to work with. Whip it with your hand will be better because you will be able to control the speed and don't end up with the overwhipped cream. 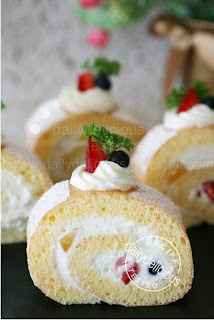 Hi, I have just tried out the rolled cake today. Everything goes on well, except that my cake turned out to be sticky in texture. Do you know what could have went wrong? It also has a strong egg smell or it meant to be like this? Thanks! Egg smell can come from the age, old egg can have strong smell,and the origin of the egg. Some of my friends say that using organic egg can reduce this problem too. 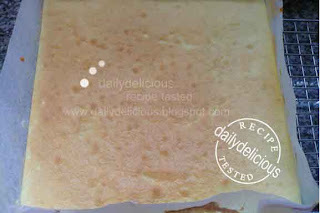 The stickiness could come from 2 part, first the sponge was not cooked enough and the second the humidity in the air ^^. Hello, how many days can the cake be stored? Not more than 3 days, the cake will dry and whipped cream will be spoiled. Hi, thank you for the recipe! My cake turned out very dense and heavy though, i think this happened only after unrolling the cake. could you give some suggestions as to what I could have done wrong? the cake seemed fluffy when it came out of the oven..
Is it still fluffy before rolling? If that happen after rolling it can come how you roll it ^^. Did you press it too hard. First the green tea roll is souffle sponge that some part of the ingredients are cooked before mixing. It's different from the simple sponge, for the sponge you can make it many ways, by whipping whole egg or separated egg white and yolk before whipping. The different in texture is a bit but they fall into the simple sponge group. The method of rolling the sponge immediately after baking will make it easier to roll as the time that we take the sponge out, it's easy to stretch. But you can skip this step and use a knife to score the roll before rolling it too. Use 3 eggs, but separate them into yolk and white. Oh it does look yummy - thanks for the recipe and happy holidays! You will need to replace cake flour with 4-5 grams of cocoa powder ^^.